7 Psychological Tricks That Make You A More Persuasive Person - Something New Everyday! Maybe you need to persuade a friend to go on a holiday with you, a colleague to see your point of view or get your boss to give you that promotion. You may have to close a sales deal, counsel somebody to avoid self-harming behavior or persuade someone to do you a favor. 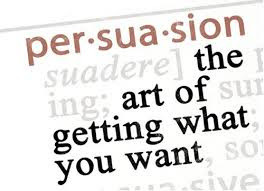 Whatever the situation, you will need to be more persuasive. Magicians and advertisers are using hidden persuasion techniques and manipulative tricks which are rarely obvious. The only problem is that they are not so willing to reveal these so we will have to resort to more mundane hacks which are nevertheless more than effective. Choosing your words carefully will be an enormous advantage. But body language and other tactics will help you to deliver your message or present your case much more effectively. 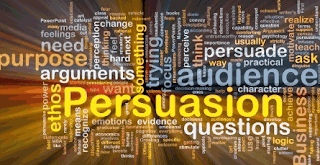 Here are 7 tricks you should keep in mind when you want to be more persuasive. Not many people realize that emotion al intelligence is the innate ability we may possess to recognize, understand and manage emotions. This is a powerful tool in persuading people to convince them that certain actions are no brainers. Martin Luther King Jr. and his speechwriter Clarence Jones knew this very well. It was a clever combination of indignation, reason, anger and hope. Just reflect on the emotions he aroused when he said that a land "sweltering with the heat of oppression" could be "transformed into an oasis of freedom and justice." In normal situations, you will demonstrate your EQ by showing social awareness by being conscious of the emotions and feelings of the people you are dealing with. This helps you to empathize and you show that you see where they are coming from. It helps you build a rapport and a stronger bond which are essential elements in the process of persuasion. Albert Mehrabian is current professor emeritus of psychology at the University of California and he has done extensive research on non verbal communication. His work shows that when words fail to convince or persuade, body language wins the day and will be the more effective way of communication. That is why it is so important to pay attention to the way we stand, sit, talk, use eye contact and how we wave our arms about! Imagine trying to persuade someone to vote for an issue in a referendum. You may spout a slogan with arms folded, no eye contact or mumble something unclearly. It is obvious that the person will notice your body language much more and will neither be impressed nor persuaded. You might be tempted to use an email to make a difficult request or a phone call. But when it comes to being more persuasive, nothing beats face to face contact. Next time, take a walk down the corridor and talk to the person rather than using the phone. It is also good exercise! In politics, there are lots of studies that show that face to face contact is the most effective method of all in persuading people to vote for a candidate or cause. There are lots of studies on how the power of touch can influence and persuade people whether in personal relationships or in business. We know that waiters will be tipped more if they learn the art of unobtrusive touching. There are research studies on shoppers who were touched who spent more time in the store and bought more! Time and time again, studies show that the power of touch tends to put people in a better mood and has a powerful healing effect. Touching makes people more open to requests and persuasion. While this is powerful, you need to be aware that certain cultural and religious customs might regard it as an intrusion. It is also very interesting to reflect on the fact that the healing power of touch has almost always been avoided by psychotherapists. Persuasive people are not great talkers, they are great listeners. It works almost every time. Why? Well if you want to persuade, you must first find out how likely they are to accept your idea or request. Then, you have to find out whether there are any obstacles, objections or doubts. The most important thing of all is to be ready when you spot the openings for agreement which is when you will go for the kill and capitalize on it. Above all, you are in a stronger position when you know the other side of the argument. It pays to listen! In a fascinating study done by the University of Michigan, researchers found that the rate of speech when persuading was an important, and often, overlooked factor. Speech rates, pitch and fluency were all measured in telephone interviewers where they were trying to persuade people to take part in a survey. The optimal speed of speech was about 3.5 words per second which is moderately fast. Also, the interviewers who built in 4 or 5 pauses every minute were more successful. Speaking too quickly was perceived as being suspicious (the classic fast talker!). Speaking too slowly gives the impression of being too pedantic or less intelligent. Also, researchers found that being too lively and enthusiastic was off putting in many cases. If you are trying to persuade somebody to do something, think like you or buy from you, you are aware of the enormous benefits flexibility can bring. We can learn from young children here who have a variety of behaviors which usually help them get what they want. They can go though the usual list of crying, sulking, bargaining, pleading and even charming you before you give in and give them what they so desperately want. Parents always say "No" which is often ineffective. The lesson we can learn from this is that we need a more flexible approach as regards behaviors when we are involved in the persuasion process. Being open minded and never dogmatic will also help enormously. 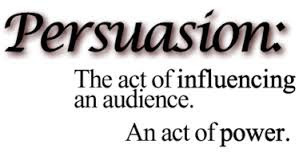 As we have seen, the art of persuasion is a fascinating area. Let us know in the comments if you have perfected the art with some examples, if you are willing to share them!